I visited the United Arab Emirates in 2018 and really enjoyed this tiny Middle Eastern country. The September heat was insane (winter is a better time to visit), but the city sights were still amazing and worthwhile. The UAE is made up of seven states, or emirates, but the two that are most popular as travel destinations are the emirates of Dubai and Abu Dhabi. Dubai is known for its resorts and shopping malls, and Abu Dhabi is known for Ferrari World and the Sheikh Zayed Grand Mosque. Hopefully these pictures of Dubai and the UAE inspire your travels! Rugs for sale in the Al Fahidi Historical Neighborhood of Dubai. The Sheikh Zayed Grand Mosque was built between 1996 and 2007. It’s dedicated to Sheikh Zayed bin Sultan, the founder of the UAE. The Sheikh Zayed Mosque is the largest mosque in the UAE, and it’s located in Abu Dhabi. The inside of the mosque has the world’s largest Persian carpet, and the world’s 3rd largest chandelier. This is what the smaller domes look like from inside the mosque when you glance up. This is the world’s 3rd largest chandelier, and it was imported from Munich, Germany. The pools around the mosque reflect the columns and hallways. Traditional Arabic teapots for sale in Dubai. Traditional Arabic daggers for sale in the Al Fahidi Historical Neighborhood. Perfumes for sale in the historical district of Dubai. Shiny desktop trinkets for sale at one of the souvenir shops in Dubai. More perfumes for sale in the window of a Dubai shop. Here’s a view from the 124th floor of the Burj Khalifa in Dubai. This is currently the world’s tallest building. This is what a typical souvenir shop in Abu Dhabi looks like. Camel not for sale! A drinking fountain mural in Abu Dhabi. Ferrari World is a sports car-themed amusement park in Abu Dhabi. It also has the world’s fastest roller coaster. Cars on display at Ferrari World in Abu Dhabi. Domes and columns in the courtyard of the Sheikh Zayed mosque. 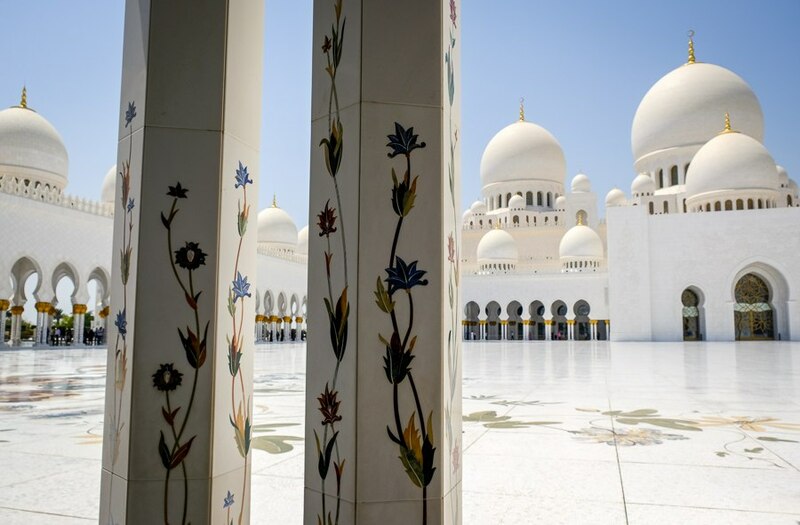 The Sheikh Zayed mosque looks like something straight out of Aladdin, doesn’t it? I love the colors and design.